This antibody may replace item sc-10010 from Santa Cruz Biotechnology. ADARB1 is an enzyme responsible for pre-mRNA editing of the glutamate receptor subunit B by site-specific deamination of adenosines. Studies in rat found that this enzyme acted on its own pre-mRNA molecules to convert an AA dinucleotide to an AI dinucleotide which resulted in a new splice site.This gene encodes the enzyme responsible for pre-mRNA editing of the glutamate receptor subunit B by site-specific deamination of adenosines. Studies in rat found that this enzyme acted on its own pre-mRNA molecules to convert an AA dinucleotide to an AI dinucleotide which resulted in a new splice site. Alternative splicing of this gene results in several transcript variants, some of which have been characterized by the presence or absence of an ALU cassette insert and a short or long C-terminal region. 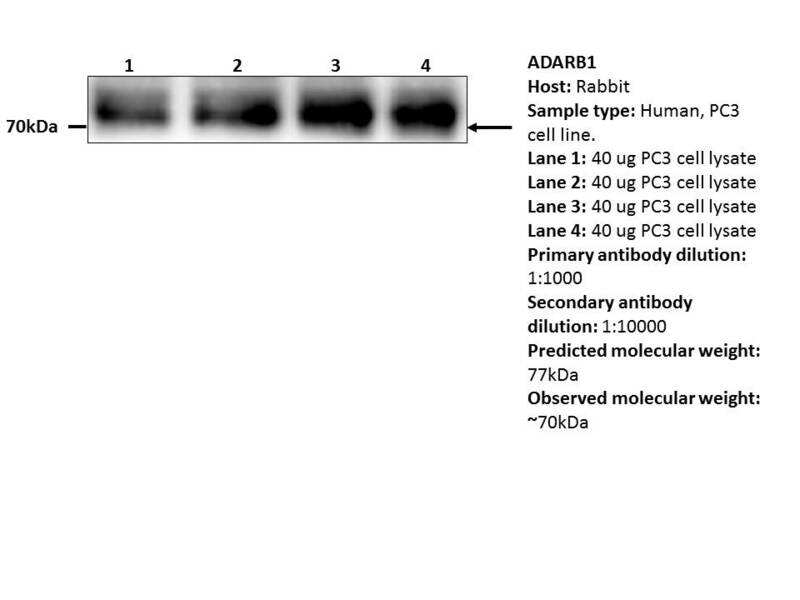 Find tissues and cell lines supported by DNA array analysis to express ADARB1. Find tissues and cell lines supported by RNA-seq analysis to express ADARB1. Sample type/lane description: Human, PC3 cell line. Cells lysis were collected after half an hour on ice. Loading buffer was added to terminate the reaction. Standard procedure of western blot was applied.